How can seat belts and airbags protect you? At what speed can you die in a car crash? obstacle - the situation is different when we hit a bush or a tree. We can't precisely calculate whether we survive or not, but we can make some estimations to be aware of crash consequences. What happens if you drive with the speed of 20 mph and you suddenly stop? Just imagine that a 7 tonne block lies on your chest. Yes, it's almost the same. Recently, the NHTSA (National Highway Traffic Safety Administration) performed many crash tests with dummies. Basing on these tests, we can make some approximations at what speed you can die in a car crash. In this car crash calculator, we explain how to calculate the impact force in car crashes and how seat belts and airbags can protect you. You'll find out that they can drastically increase your chances to survive. With the following text, you can learn about the force of impact definition and impact force equation. You do not need to be the driver to know that you can't stop the car immediately. The total stopping distance depends on the perception time of a driver and the braking distance. If you want to find out how far you will travel before your car stops, check out our stopping distance calculator now! d is the distance traveled during collision. This is a special case of impulse and momentum formula. Now, you can see that extending the time of the collision will decrease the average impact force. Let's consider two situations where you jump from a specific height. In the first case, you jump to the ground and in the second, on a trampoline. Because the surface of a trampoline is more stretchy, it extends the time of the collision. You can feel that your legs are subjected to a lesser average impact force. This case is analogical to car crashes. Cars are made to collapse upon impact extending the time of the collision and lessening the impact force. That's why they can't be too durable. Impact force formulas we used above describe an ideal collision between two objects. In the real situation of a car crash, the profile of force during the accident can be more extensive - e.g., you should take into account that car collapses and that a human is not a point mass but a complex body. However, you can still make some estimations of impact force during a car crash. Take a look at the picture below. At first, the driver sits in the car that is in constant motion with a speed v. Then, a car hits the tree and immediately stops. The driver flies forward due to the inertial force until he is stopped suddenly by the impact on the steering column or windshield. The stopping distance is very short because none of the colliding objects (including body and, e.g., windshield) are contractible enough. We can estimate it to be approximately 4 cm (you can change it in the advanced mode of this impact force calculator). How to calculate the impact force acting on a driver with the mass of 70 kg? Let's use our car crash calculator! If the initial car speed is 30 km/h and the distance of collision is 4 cm, then the impact force is about 60 kN. It is an equivalence of 6 tons! It is just as if someone put a large stone block on your chest. On the other hand, the stopping time is only 9.6 ms which means that to reduce the driver's velocity from 30 km/h to zero, the driver has to decelerate almost 89 times faster than is Earth's standard gravity g.
The primary task of seat belts and airbags is the same. They both extend the distance of the collision. Assume that we've got the same situation as before. The 70 kg driver drives a car with a speed of 30 km/h, but this time, he is firmly held in seat belt harness. The seat belt will stretch a little bit when the impact force is applied. We can say that it can expand by about 20 cm (you can change it in the advanced mode of this impact force calculator). Again, after using the car crash calculator, you can obtain the average impact force of about 2.5 kN that is almost 25 times smaller than without the seat belt. It corresponds to the weight of 1.24 tons. The stopping time lengthens to 48 ms, and now, the driver decelerates "only" 18 times faster than with Earth's standard gravity g.
To sum up, the seat belt is designed to stop your body from hitting hard things in the car and reduce the impact force you experience by spreading it out over a time. The seat belt could occasionally contribute to severe internal injury or even death if the impact force is too big. However, nowadays seat belts have a mechanism that breaks them at a predefined level of stress. Usually, there are still airbags placed in front of the driver in order to increase their safety. We have made an example with the driver, but any person in the vehicle is subjected to these dangers. If you crash with a heavy truck, it doesn't matter whether you sit behind the wheel or at the back seat of the car. Even in the low-speed collisions, the impact force which stops your body is in the range of tonnes. You simply won't be able to hold on and prevent injury without fastened seat belts. Moreover, if you sit at the back of the car and you aren't constrained by a seat belt, you will fly straight ahead like a boulder of several tonnes. You will not only hurt yourself but also your friend in front of you! This is one of the questions that don't have one unambiguous answer. The heavier the car is, the harder it is to stop it, and the impact force is smaller. On the other hand, the vehicle will immediately stop if it hits a wall of a house, but the situation will be different if it hits another car that participates in traffic. Therefore, we must take into account many different factors. In general, high speed doesn't produce harmful injuries. What is dangerous for a human is the high acceleration or deceleration given at a specific amount of time. The National Highway Traffic Safety Administration (NHTSA) is an agency that conducts traffic safety research around the world. It describes its mission as Save lives, prevent injuries, reduce vehicle-related crashes. The NHTSA states that "the maximum chest acceleration shall not exceed 60 g for time periods longer than 3 milliseconds" (source: NHTSA). 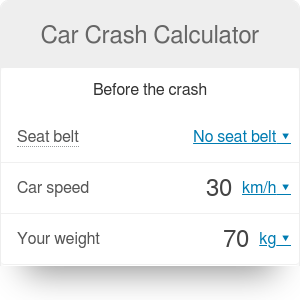 With our car crash calculator, you have learned that the accelerations during car crashes can be a lot higher than 60 g without fastened seat belts. So use them and save your life! NHTSA states that seat belts reduce death rates by 45% and reduce the risk of injury by 50%. Car Crash Calculator can be embedded on your website to enrich the content you wrote and make it easier for your visitors to understand your message.